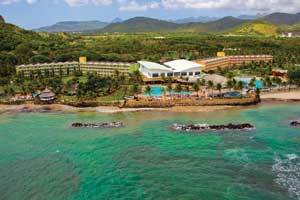 Coconut Bay Beach Resort and Spa is an all-inclusive resort with a prominent oceanfront setting that features two worlds in one on Saint Lucia's exotic south side. A tranquil, adults-only oasis offers the perfect setting for those seeking a romantic escape with a coconut palm fringed pool, hammocks, intimate cabana beds and the Kai Mer Spa. At the opposite end, families are drawn into the resort's tropical playground featuring children's programs, activities and the CocoLand water park. With the option of separate areas for vacationing, Coconut Bay Beach Resort is designed to please all ages on their casual, Caribbean vacation. With a prominent oceanfront setting, the all-inclusive beachfront Coconut Bay Beach Resort & Spa features two worlds in one on Saint Lucia's exotic south side. A tranquil adults-only oasis offers the perfect setting for those seeking a romantic escape with a coconut palm fringed pool, hammocks, intimate cabana beds and the Kai Mer Spa. At the opposite end families are drawn into the resort's tropical playground featuring children's programs, activities and the CocoLand water park. 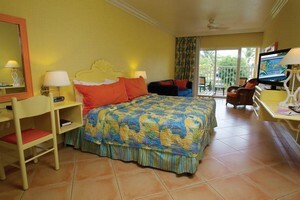 Designed to please all ages, a casually Caribbean vacation at Coconut Bay is perfect for couples, families or singles. Coconut Bay Beach Resort is a 5 minute drive from the Hewanorra International Airport (UVF), also located in Vieux Fort; and an hour drive south of Castries and George F. L. Charles Airport (SLU). Note: Airport transfers to and from Saint Lucia's Hewanorra International Airport are included in your all-inclusive hotel rate. Families enjoy Coconut Bay's playful Splash wing. Colorful rooms on the four floors of the Splash wing were designed and decorated with parents and children in mind. Splash faces the ocean and overlooks the CocoLand Water Park, Saint Lucia's largest water park, featuring a lazy river and large slides, large family pool and the Atlantic beach. The Kidz Klub is just steps from Splash and is easy to find by the gleeful sounds of youngsters enjoying its colorful water feature, expansive fenced outdoor play area and air-conditioned playroom. The tranquil oceanfront Harmony wing of Coconut Bay caters to adults 18+ only. Peaceful rooms overlook an adult-only area, which includes a palm-shaded pool and bar, chaises and hammocks, intimate cabana beds and the Kai Mer Spa. The fourth floor premium rooms were recently upgraded and include mini-fridges, flat screen televisions, soothing contemporary decor and top-of-the-line linens and toiletries. Harmony offers adults an ideal location for soaking up the sun or dozing off under the swaying palms in a serene tropical oasis. The Coconut Bay Beach Resort and Spa is excited to announce a new attraction! Newly added to the resort is the Coco Coral Petting Zoo; admission is FREE to all guests staying at the resort. Be sure to stop by and visit the goats, ducks, and even baby sheep! Also featuring a new amenity! CocoLand Kidz Club now has the option to allow parents to sign in and out a local cell phone when they leave their children at the Kidz Klub program. No more worries about your children's well-being when being dropped off at a club; easily check up on them, while allowing yourself to enjoy alone time! Terms and Conditions: Resort Credit booklet will be given at time of check-in. 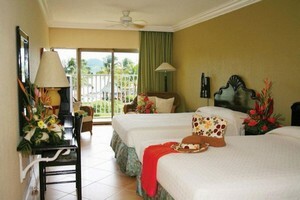 Resort Credit is in USD and must be redeemed at time of reservation or service. Resort Credit offers do not hold any cash or commercial value, are not refundable and non-transferable. They are not applicable for tips, taxes, private functions and or special events such as weddings or private reception dinners. They are only valid during the original stay and cannot be deducted upon check-out. Resort Credit cannot be exchanged for cash, products or merchandise. Resort Credit is applicable only towards the mentioned tours. All services and tours require reservations. No refunds will apply in the event that a guest does not arrive for a schedule tour or service. Tours and Services are subject to availability. There is no cash reimbursement if unused. Restrictions apply. Not combinable with other promotions or special offers. This entire offer is based on availability and cannot be modified or closed out at any time. Employees of tour operators, travel agents and wholesalers do not qualify. NOTE: Taxes and Fees will apply to products and services which can be paid with cash or credit card. Combinable with our 2016 EBB offer.